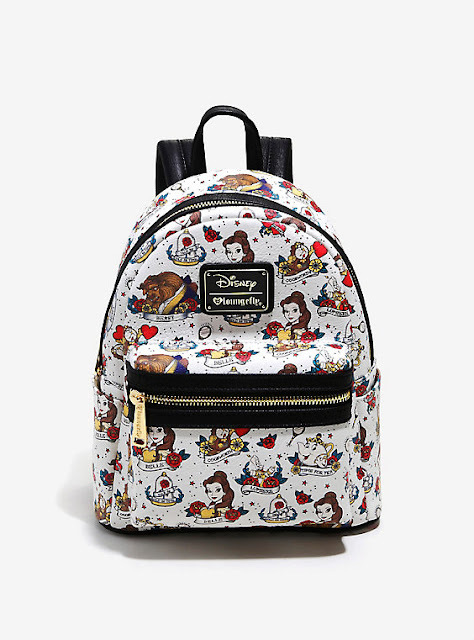 Win this cute Beauty and The Beast mini-backpack from Loungefly! This giveaway is open worldwide and the winner will be notified by email! Good luck! I do not already have my tickets but I am definitely going to se this movie. I do not have tickets yet. This would look great alongside my new Beauty and the beast purse and wallet. I don't have my tickets yet... the 14th is my birthday and I was hoping to celebrate it by seeing it opening day, but my boyfriend works doubles allllll weekend! Plus, we're apparently getting hammered with snow here on the East Coast next week. I am hoping to see it by next Tuesday! I have not bought movie tickets to see 'Beauty and The Beast' yet. I plan on buying them on opening day. I thought that would make things even more exciting! I don't have tickets yet, but we're planning on seeing it. I don't have my tickets yet, but I will be going to see the movie soon after it releases. I'm waiting until the week after to go. No I do not have tickets yet. I don't have tickets but planning on watching it once its out for a while because don't like going when its released because there going to be a lot of people. Yes! Husband, 8 yr old daughter and I are all set to watch next weekend! I don't have tickets yet but I plan on going! I don't have tickets yet because I'm not sure which day we'll be able to go on opening weekend. I DO, however, have a new Beauty and the Beast tee to wear! Can't wait! Nope not yet but getting them this Monday!! I have my tickets to El Capitan in the 17th! I can't wait!!! I don't have my tickets yet :( because I work the entire first weekend out but hope to see it the Monday after when I'm off!! Not yet, purchasing them this week! Cannot wait! Not yet but I know where and when I'm going. YES!! I have tickets for Sunday!! I don't have my tickets yet, I'm not sure who I'm going to drag to see the movie with me. No, I don't have my tickets yet. No, but planning to see it for my birthday next week. We haven't bought our tickets yet, but we will be there! I haven't bought our tickets quite yet but we definitely will be getting them in the next week or so! Yes i Already Watched it Yesterday . :) those Furnitures almost made me Cry 😅 I Love Beauty And The Beast . Its Musical , Classic , Spell binding . Perfectly Awesome Movie.